At Wednesfield Tae Kwon Do we welcome all new beginners from any background. 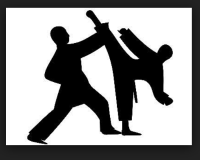 Men, women & children can benefit from learning Tae Kwon Do. It will improve your fitness, flexibility and most of all your confidence. The need to learn some form of self defence is becoming increasingly more important in modern life. Tae Kwon Do is arguably the best method of developing confidence into children and at the same time emphasising the importance of respect and discipline. The Club trains on two days - Monday and Thursday. For further information please get in touch or visit website.